On the flyleaf at the beginning of A Grammar of Motives, Kenneth Burke writes "Ad bellum purificandum"—"towards the purification of war. "1 What does this phrase mean? Why does KB place it thus prominently at the beginning of A Grammar of Motives? What is the origin or source of this phrase? 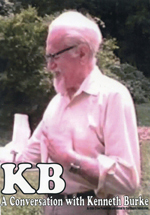 Kenneth Burke Library Photo, July 2006, showing KB's handwritten phrases above the window frame. Click here or on the image to view a larger version. Kenneth Burke Library Photo, July 2006, showing Libby's Welcome sign. Click here or on the image to view a larger version. 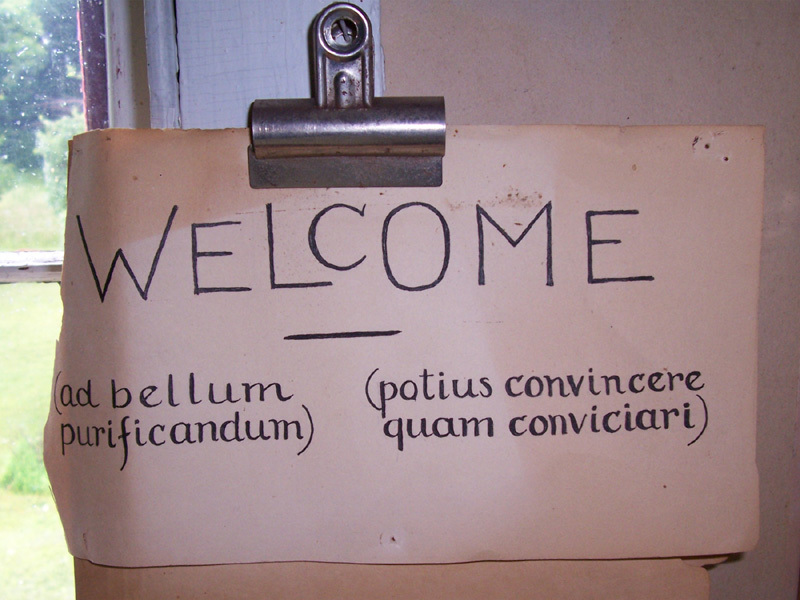 These same two phrases also appear on a Welcome sign, in KB's wife Libby's elegant script, hung to the right of the window frame. The first phrase may be translated literally "rather to prove or demonstrate than to revile or reproach" or, to retain the spirit and alliteration of the original, "better to prove than to reprove" or "better to debate than to berate." On the face of it, "Ad bellum purificandum" seems to be a "perspective by incongruity"—a juxtaposition of seemingly incongruous words—such as T. S. Eliot's "decadent athleticism" or Thorsten Veblen's "trained incapacity. "2 By juxtaposing the above two phrases, however, KB seems to be suggesting a way to explain (if not resolve) the incongruity. War, he suggests, may be purified through logic or dialectic, that is, through the exercise of the arts of proving or demonstrating our beliefs and actions to others rather than merely reviling or reproaching them. We have reviewed the notes and underlining in the texts of Cicero and Quintilian in KB's library but have not been able to locate the source of either of these phrases.3 We note, however, that KB frequently uses Latin (and Greek, French, German, etc.) 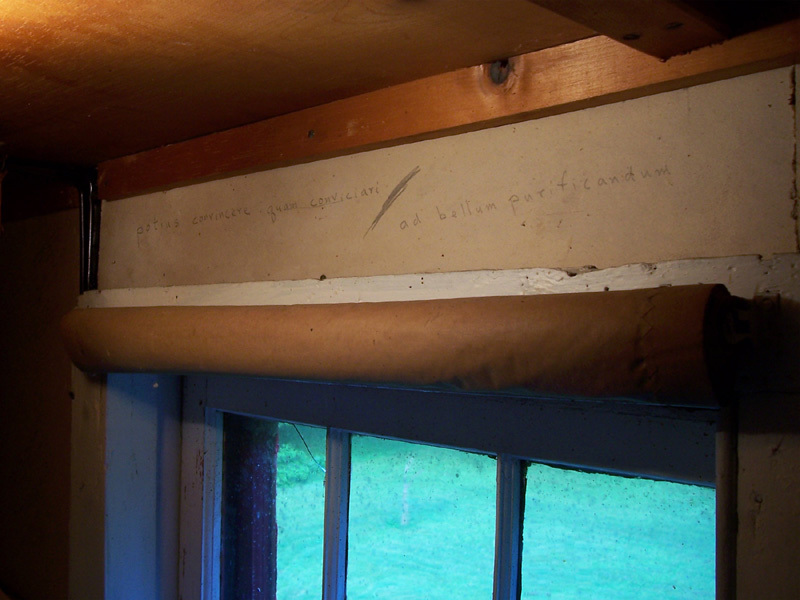 phrases in A Grammar of Motives and A Rhetoric of Motives.4 We also note that he wrote numerous Latin and Greek phrases on the wall to the left of the window frame. He also wrote copious notes—in Greek—in the margins of his Modern Library edition of The Phaedrus.5 KB loved words—in many different languages. Thus we suspect that the two phrases might be—indeed very likely are—his own. We append some additional thoughts, from each of us, on the meaning and significance of these two phrases and invite further responses from others. Read alone, the phrase ad bellum purificandum—toward the purification of war—is ambiguous. On the standard reading, it suggests that war can somehow be purified, distilled so as to rid it of impurities. But it can also be read as referring to a purification that is effected by means of war. A line from Lincoln's Second Inaugural Address offers an example: "Yet, if God wills that [the war] continue, until all the wealth piled by the bond-man's two hundred and fifty years of unrequited toil shall be sunk, and until every drop of blood drawn with the lash, shall be paid by another drawn with the sword, as was said three thousand years ago, so still it must be said 'the judgments of the Lord, are true and righteous altogether. '"12 A somewhat different example would be a war of ethnic cleansing. The texts of Burke's Grammar and Rhetoric make it clear enough that his motive in that great exploration of motivation was to purify war rather than to purify by means of war. Having lived through a half century marked by massive genocides and two world wars, Burke sought to understand how the warlike impulse might be distilled into symbolic action. And if the text of the work to which ad bellum purificandum serves as epigraph were not sufficient to disambiguate the phrase, the couplet of which it forms the second member—recorded and translated nicely above—does the trick. But why, having inscribed the unambiguous couplet over his window frame, did Burke choose to inscribe only the ambiguous second member of the couplet on the flyleaf of the Grammar of Motives? Perhaps he just didn't notice the ambiguity, as I suspect most of his readers don't. But Kenneth Burke was not most readers. Surely he would have noticed the ambiguity created by removing the first line of a couplet he himself had apparently written in the first place. So what might he have meant in creating this ambiguity? Jim Zappen underscores the preposition ad in the epigraph, with its ironic suggestion of a hope forever unrealizable. Perhaps even deeper in that ad is the suggestion of a fork in the road before which we stand at each moment of our increasingly tenuous existence. One direction leads toward transforming our bellicose impulses into symbolic action—debate, ritual, poetry. The other leads toward holocaust. And as another great twentieth-century sage once said, "When you come to a fork in the road, take it." This belief that one cultivates an attitude of tolerance through a method of linguistic analysis can be seen clearly through Burke's teaching in the classroom. Burke's pedagogy undoubtedly was shaped by the fact that he wrote and taught in a political and cultural moment when war was "always threatening. "17 New archival materials at Penn State University provide a glimpse inside Burke's Bennington College classrooms and reveal how he taught his students a method of proving and demonstrating as a means to temper their inclinations to revile and reproach. Comments on his students' essays show that Burke used the writing assignments in his courses to teach students the technique of "indexing," that is, identifying key terms in a text's symbolic action and charting the associations between these terms.18 Throughout his comments, Burke stressed that students needed to devote significantly more energy to "summing up" an author's key terms before they could conceivably "turn later to objections. "19 Burke's teaching of indexing to undergraduate students underscores his belief that it was the method of symbolic analysis that made it possible to cultivate an attitude of tolerance and linguistic skepticism. Indeed, as he explained to a student in his 1955 "Language as Symbolic Action" course, Burke taught indexing because it forced students to prove and demonstrate how language worked in a particular text, thereby curbing the tendencies of students who had "become so zealous in [their] attempt to destroy" the positions of others.20 In this new discovery of "potius convincere quam conviciari," then, we are reminded of the means by which we, as did Burke himself did, can cultivate an attitude that leads us to debate, not berate, about how to shape our world. 1Kenneth Burke, A Grammar of Motives (1945; Berkeley: University of California Press, 1969), 319-20, 442. We are grateful to Michael Burke, Julie Whitaker, and Anthony Burke for generous assistance with the biographical background, the translations, and the photographs for these notes. The photographs are ©Kenneth Burke Literary Trust, Anthony Burke, Co-Trustee. 2 Kenneth Burke, Permanence and Change: An Anatomy of Purpose, 3rd ed. (Berkeley: University of California Press, 1984), 7-9, 69-70, 89-92. 3 Cicero, De oratore, trans. E. W. Sutton, Vol. 1, Loeb Classical Library (London: William Heinemann; and Cambridge: Harvard University Press), 1942; Cicero, Brutus, trans. G. L. Hendrickson; Orator, trans. H. M. Hubbell, Loeb Classical Library (London: William Heinemann; and Cambridge: Harvard University Press), 1939; Quintilian, The Institutio Oratoria of Quintilian, trans H. E. Butler, 4 vols., Loeb Classical Library (London: William Heinemann; and Cambridge: Harvard University Press), 1921-22. 4 Burke, Grammar, 6, 9, 12, 15, 20, etc. ; Kenneth Burke, A Rhetoric of Motives (1950; Berkeley: University of California Press, 1969), 10, 13, 36-37, 39, 49-52, etc. 5 Plato, Phaedrus, in The Works of Plato, ed. Irwin Edman, The Modern Library of the World's Best Books (New York: Random House, The Modern Library, 1928), 263-329. 8 Kenneth Burke, "On Persuasion, Identification, and Dialectical Symmetry," edited with introduction by James P. Zappen, Philosophy and Rhetoric 39 (2007): 333-39. 9 Burke, Rhetoric, 200. Burke, Grammar, 429, describes this dialectical transcendence thus: "For in both the Platonist and neo-Platonist versions of transcendence, the dialectician begins with the particulars of the senses, with the images of imagination—and he [or she] subjects these to progressive transformations whereby their sensory diversity is thoroughly lost in generalization, the structure being completed in the vision of the One." Kenneth Burke, Language as Symbolic Action: Essays on Life, Literature, and Method (Berkeley: University of California Press, 1966), 188, explains how this same dialectical transcendence functions as a rhetoric of identification: "In many ways, drama and dialectic are alike. Both exemplify competitive cooperation. Out of conflict within the work, there arises a unitary view transcending the partial views of the participants. At least, this is the dialectic of the ideal Platonic dialogue." 11 Burke, Language as Symbolic Action, 18. 12 Don E. Fehrenbacher, ed., Abraham Lincoln, Speeches and Writings 1859-1865 (New York: The Library of America, 1989), 687. 13 Burke, Grammar, 319, 317. 17 Kenneth Burke, "Linguistic Approaches to Problems in Education," in Modern Philosophies and Education: The Fifty-Fourth Yearbook of the National Society for the Study of Education, Part I, ed. Nelson B. Henry, 259-303 (Chicago: University of Chicago Press, 1955), 272. For an analysis of how the ever-looming threat of nuclear war shaped Burke's language arts' pedagogy, see Jessica Enoch, "Becoming Symbol-Wise: Kenneth Burke's Pedagogy of Critical Reflection," College Composition and Communication 56, no. 2 (2004): 272-96. 18 Kenneth Burke, The Philosophy of Literary Form, 3rd ed. (Berkeley: University of California Press, 1973), 8-25. 19 Kenneth Burke, Comments on Bennington College Student Essays, 1955, Folder R17, Kenneth Burke Papers, Paterno Library, Pennsylvania State University. 20 Burke, Comments on Bennington College Student Essays. I enjoyed reading all three of these takes on Burke's summarizing slogan. The authors' research on the question of meaning took them to Burke's home and the inscription above the window in Burke's library. The Latinized gloss they found there on what Burke had in mind with his maxim, "Toward the purification of war," is illuminating: "Better to prove than to reprove," or, "Better to debate than berate." Now, Zappen paraphrases Burke as saying, "We cannot get to identification [Burke's key term in his Rhetoric] by way of Aristotle, but 'we must look rather to the Platonist line . . . .'" From there, Zappan analogizes Burke's and Plato's notions of the hierarchal structuring that inherently devolves from symbolic action. "Order" always takes some kind of pyramidal form in linguistic acts and in what follows from the linguistic motive---the "social structur[ing] in which people think of themselves as participants" situated on some ladder of value. The dialectic of the "Upward Way" will signal the direction to be followed in seeking and finding the "bridging term" or "god-term" that can subsume, and therefore unite in "cooperative competition," the disparate terms, interests, or groups that comprise the parts, steps, or stages in the hierarchal struggle the combatants in question engage in. Such a method of working out the implications of the language acts at issue to something like "the end of the line" can point the way toward at least potential identification of an "associative." and therefore possibly pacific, kind. One, I see adumbrations of identification in Aristotle, too. As Johnstone says in his article on the "Enthymeme" in the Encyclopedia of Rhetoric, quoting Aristotle in part (p. 248), "'Since the persuasive is persuasive to someone,' the speaker must form enthymemes from what seems to be true to the particular audience rather than to 'all, or most, or the wisest people.'" Johnstone adds: "An enthymematic statement is built on the tacit knowledge and beliefs an audience holds, and these are usually invoked only implicitly in the argument itself" (p. 249). Aristotle's key rhetorical term "enthymeme" seems to me, therefore, not all that distant from Burke's concept of "identification." A dramatistically imbued rhetor will surely articulate some of his or her appeals/arguments with an audience's beliefs about who are the heroes or villains, agents or counteragents, in this drama, the causes or purposes, organizations or agencies, lifestyles or characteristic patterns of action, locales or scenes of operation, that are good or bad, for us or against us. A speaker can hardly construct a potently "identifying" case in a particular ideological venue without some kind of enthymematic overlap, I don't believe. Two, isn't it a bit ironic that, in Zappen's take on Burke and identification as a following through on a dialectic of "upward" linguistic mobility, that such an "entelechial" or "perfectionistic" motive should be the driving force? Overall, entelechy/perfectionism is Burke's bete noir. That potent incentive that shadows our symbol systems is the blameworthy cause of the lust for "Empire" that Burke decries at the conclusion of the Grammar. How can we go "comic," settle for the "better, not the best" (see ATH on William James), and still strive for an ultimate transcendence? Just pointing to a possible paradox.